Pine nuts are an essential part of the renowned Mediterranean diet. They are one of the key ingredients of the Italian pesto. The pine nuts that are harvested in Europe mostly come from the stone pine (Pinus pinea), which has been cultivated for its nuts for over 6,000 years. Lately, its great commercial success has led other countries to try and grab part of the market. One of these countries is China. Having been consumed in the Mediterranean without any adverse health effects for millennia, some strange news appeared that consuming pine nuts can cause taste disturbances, lasting from a few days to a few weeks after consumption. A bitter, metallic, unpleasant taste lasting 1-3 days after ingestion of pine nuts is reported, being worse on day two and typically lasting up to two weeks. Cases are self-limited and resolve without treatment. This phenomenon was first described in a scientific paper in 2001. Publications have made reference to this phenomenon as pine nut syndrome or as pine mouth. At least several thousand cases have now been described in the scientific literature. A 2011 study has indicated that nuts from a related species, the Chinese white pine (Pinus armandii), which occurs mostly in China, are the cause of the problem. The nuts of this species are somewhat smaller, duller, and more rounded than original pine nuts. The specific toxin that is apparently present in affected nuts has not yet been isolated. Luckily, there are no known lasting effects and the FDA reports that there are "no apparent adverse clinical side effects". 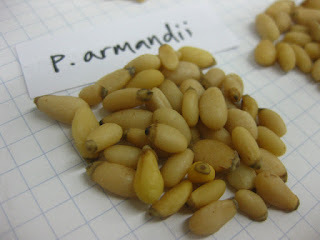 A large and very interesting weblog about the pine nut syndrome can be found here.